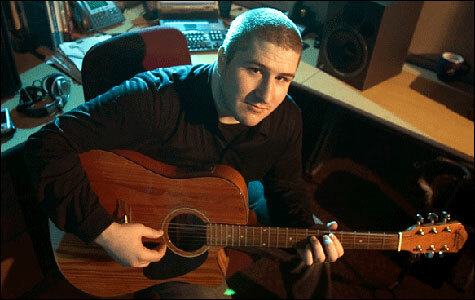 Shawn Fanning was born on November 22, 1980, in Brockton, Massachusetts. He worked summers at his uncle's (John Fanning) Internet company, called Chess.net. During this work, wanting to create an easier method of finding music than by searching IRC or Lycos, he spent months writing the code for Napster, a program that could provide an easy way to download music, using an anonymous P2P (peer-to-peer) file sharing service. After graduating from Harwich High School in 1998, Shawn enrolled at Boston's Northeastern University, but he rarely attended class and spent Christmas break working at the Hull, Massachusetts chess.net office with his uncle John, pushing himself to get the Napster system completed. In January, 1999, Shawn drops out of Northeastern University after the first semester, to finish writing the software. The service, named Napster after Fanning's hairstyle-based nickname, was launched in June 1999 and worked till July 2001, before to be shut down by court order. Shawn's uncle ran all aspects of the company's operations for a period from their office. The final agreement gave Shawn 30% control of the company, with the rest going to his uncle. Napster was the first of the massively popular P2P file distribution systems, although it was not fully peer-to-peer, since it used central servers, in order to maintain lists of connected systems and the files they provided, while actual transactions were conducted directly between client machines. Actually there were already networks that facilitated the distribution of files across the Internet, such as IRC, Hotline, and USENET, but Napster specialized exclusively in music in the form of MP3 files and presented a user-friendly interface. The result was a system, whose popularity generated an enormous selection of music to download. Napster made it relatively easy for music enthusiasts to download copies of songs that were otherwise difficult to obtain, like older songs, unreleased recordings, and songs from concert bootleg recordings. Many users felt justified in downloading digital copies of recordings they had already purchased in other formats, like LP and cassette tape, before the compact disc emerged as the dominant format for music recordings. 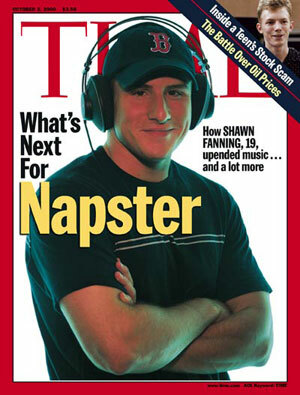 In 2000, Fanning and Napster were featured on the covers of two of the most popular magazines—Newsweek and Time (see the lower image). Napster's facilitation of transfer of copyrighted material (songs) raised the ire of the Recording Industry Association of America (RIAA), which almost immediately (in December, 1999), filed a lawsuit against it. In April, 2000, the rock band Metallica also sues Napster for copyright infringement. The service would only get bigger as the trials, meant to shut down Napster, also gave it a great deal of publicity. Soon millions of users, many of them college students, flocked to it. An injunction was issued in March, 2001 ordering Napster to prevent the trading of copyrighted music on its network. In July 2001, Napster shut down its entire network in order to comply with the injunction. In September, 2001, the case was partially settled, as Napster agreed to pay music creators and copyright owners a $26 million settlement for past, unauthorized uses of music, as well as an advance against future licensing royalties of $10 million. In order to pay those fees, Napster attempted to convert their free service to a subscription system. Thus traffic to Napster was reduced. Although the original service was shut down, it paved the way for decentralized peer-to-peer file-distribution programs, which have been much harder to control.